Christmas is almost here. 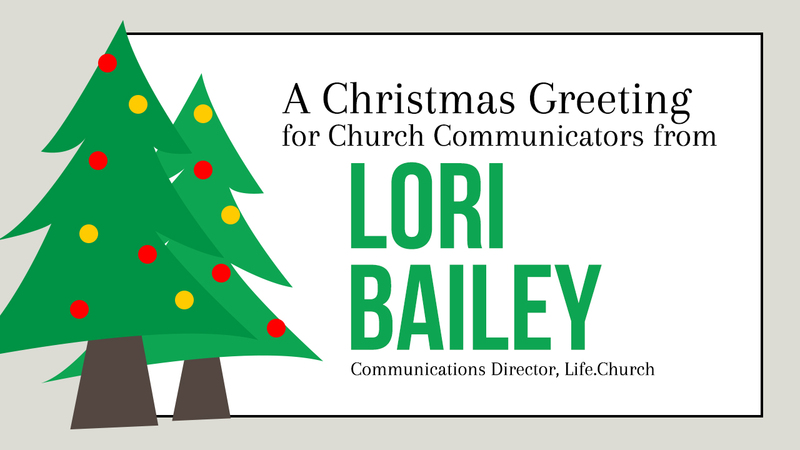 Have you been counting down—or like Lori Bailey from Life.Church, counting down to Dec. 26 because you want it to be over? That sense of frenzy is not how it should be. Are you white-knuckling it through December? That’s not what God wants for us. Come back to who we are created to be: We are gifted, we are leaders, and we are called to do his work. Through the Holy Spirit we have an unlimited source of power, energy, and joy. This is just one in a series of Christmas encouragement videos we shared with our Courageous Storytellers members throughout the season. You non-members are getting a bonus—a free, merry-filled taste of membership. We also shared videos earlier this season from Anthony Miller and Stephen Brewster. Yeah, sure, a few free videos is pretty sweet. But you missed out on videos from Dawn Nicole Baldwin, Phil Bowdle, Kelley Hartnett, Jonathan Malm, Chuck Scoggins, Brady Shearer, and myself. And there’s more to come (yes, membership has its benefits). Join Courageous Storytellers now to get access to all of these videos, as well as a wealth of practical resources and tools to help you do your job. This month we’re offering resources to help you pause. Last month it was email marketing. Before that it was welcoming guests. Before that it was productivity. Every month membership gets better. Learn more about Courageous Storytellers. Need Help With Your Christmas Design?